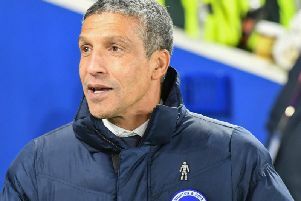 Brighton & Hove Albion manager Chris Hughton praised a fast start against Coventry City, hailed his scoring debutant Jurgen Locadia and was asked if they can win the FA Cup. Goals from Locadia, Connor Goldson and Leonardo Ulloa saw the Seagulls brush aside their League Two opponents in a 3-1 success this afternoon. By doing that Albion booked their place in the quarter-final for the first time in 32 years. The draw for the last eight takes place at 8pm tonight (Saturday) and when asked if he thinks they can go on and win the competition, Hughton said: "I have absolutely no idea. What I have is a team here that is capable of getting through to the quarter-finals. "You know when the quarter-finals come, there are the so-called big teams in there and we have found it very difficult against the big six, as such. "The answer to that is I don't know. You want to be fortunate with the draw and that means trying to get a home tie. Once the draw is made you are able to analyse the level of difficulty that will be for us." Having led on 15 minutes from Locadia's neat opener from a low, first-time Anthony Knockart cross, Hughton saluted the importance of coming out of the blocks quickly. He said: "A lot of the talk before the game to the players was about attitude and the type of game it was. If you don't match the opposition's endevour you can make it a difficult afternoon, but I thought we started well. "The application was good and it is obvious in the difference in levels, but you can only show that by applying yourself well and I thought we started really well. "Even though there is a gulf in divisions, you know that they are going to be working hard and making it as difficult as possible for us. What was important going into that second half was that we made sure we got the extra goal to relieve that pressure. "Apart from a nervy 90 minutes, we did everything quite well." With Locadia and Ulloa both starting together up front, Hughton also spoke about the importance of a debut goal for the club's record signing. He explained: "In most games we would not have gone with what you regard as two number nines. With Jurgen he can play anywhere across the front, but we played in effect with two number nines today. "What you want them to do is get off the mark. More Jurgen as a young player, Leo has been around for a while. Certainly to get off the mark early in your first game, I am delighted for him. "What was more important was that he came through the game. He hasn't played for two months now and it was important that he came through with no issues and looked quite strong." Hughton went on to praise a healthy turnout as 26,966 were at the Amex, including a noisy visiting contingent of 4,335, who packed out the south stand. The Albion boss added: "I was delighted to see it. Building up to this tie, we knew that Coventry would be taking their full allocation. It started to become obvious that there was a real desire for people to come and watch. "What we thought the crowd was going to be with each day that went past got bigger and bigger, it was a great atmosphere. Credit to the Coventry supporters, to play a cup tie as this stage at almost a full house was great for the players and the club. Hughton confirmed that Tim Krul, who was replaced at half-time, suffered a whiplash injury and is expected to be fine, while Dale Stephens withdrawal at the break was pre-planned.